Will Wuhan Use Uni-Top or SF Airlines as House Carrier? It is almost every day that one can read of either a new cargo airline or new cargo airport coming to life in China. No wonder! - considering the enormous economic potential in this vast country and the rapid rise of exports to all parts of the world. China has countless regions, many of which are jockeying for position as independent economic areas. We recently reported on planned developments for the central Chinese city of Wuhan which is located in the Hubei province. It seems that things are moving ahead fast there. The Hubei International Logistics Key Hub Project which was introduced in order to develop Wuhan into a hub mirroring that in Memphis Airport, is being strongly supported by the Hubei regional government and apparently has the blessing of the top men in Beijing. The focus it seems is entirely on the collection, handling and distribution of express shipments from China to various points across the globe. In early December 2017 the Chinese forwarder Apex Logistics introduced a thrice-weekly B747-400F service operated by Kalitta Air between Chicago and Wuhan Tianhe International Airport. The flights are geared to the carriage of e-commerce shipments from the USA to China and vice versa. 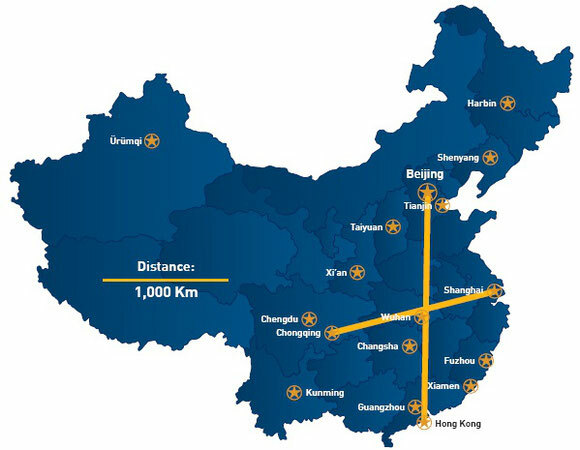 Kalitta and Apex are hoping for a long-term agreement on the sector and Apex claims that operating costs at Wuhan are much lower than if they were to utilise one or the other major Chinese airports such as Shanghai. Two Chinese carriers as possible house carriers? Wuhan-based Uni-Top Airlines and China’s SF Airlines are putting their cards on Wuhan. Uni-Top Airlines may have the advantage of being a home carrier there, but maybe SF Airlines along with mother company SF Express might come out on top if the cooperation agreement signed by them with the Hubei government can take hold. Uni-Top has a relatively old fleet of one B747-200F and five A300Fs. Recent reports indicate that Uni-Top will now acquire second-hand longer range B747-400F equipment and that they plan to start a four times-weekly service between Wuhan and Luxembourg. All geared towards e-commerce transport. On the other side - SF Airlines which operates exclusively for SF Express is said to be intent on developing Wuhan as a China’s answer to the FedEx hub in Memphis. The plan is that SF and the local government work hand-in-hand in the planning and construction of Ezhou Airport, to be situated 100 kilometers east of Wuhan as a pure cargo airport in the region. The first stage with an annual capacity of 2.5 million tonnes is planned to be finished by 2025 and the second stage giving a total an annual turnover of 7.6 million tons by 2045. If all goes according to plan, then Wuhan’s future Ezhou Airport could well become a world leader as far as being one of the world’s busiest cargo airports.